The Yanks and English knew him as “The Red Falcon.” The French call him “L’ Faucon Rouge.” The Germans curse him as “Verdamnt Der Rot Falker.” Unjustly wanted for a firing squad on his own side of the lines––Facing death from the Germans on the other! He is a man abandoned by his own country, but still willing to die for it! Along with his aide, the great African warrior Sika, The Red Falcon fights WWI on his own terms. Flying the blood-red crate they built themselves from parts of crashed planes, they are the strangest pair on the front. …And the most deadly. 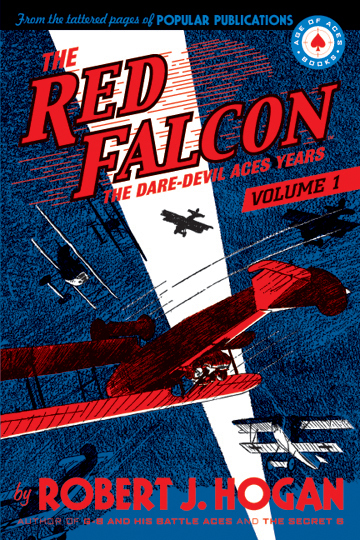 Before Signal Corp Pilot and Airplane demonstrator Robert J. Hogan created G-8 and His Battle Aces, he created The Red Falcon which ran for five years in Dare-Devil Aces before moving to G-8. Here is the premier volume of his exploits collected for the first time, including the first Red Falcon–G-8 crossover!